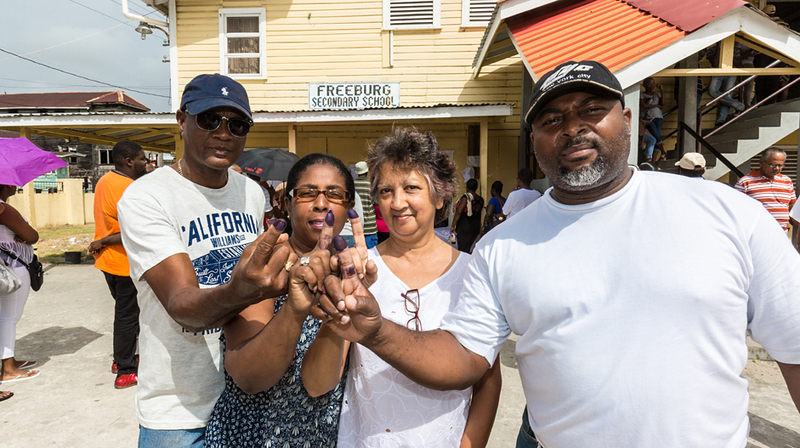 It's election day in Georgetown, Guyana, and taxi driver Kirk Embrack can't stop smiling. When he spots people he knows — and he seems to know about half of the city's 135,000 souls — he honks and sticks his hand out the window to show off the inked finger that proves he voted in today's parliamentary and presidential election. Embrack spots a friend and stops to ask him if he has voted. But Embrack sees that there isn't any ink on the man's finger, and, slipping into Caribbean patois, he asks, "How come ya finger na dirty?" Sheepishly, the man admits he hasn't voted yet, but says he will. "Good," Embrack answers. "I'm na speaking to no one with no dirty finger today." Embrack missed his chance to vote in the 2006 election because he had been working in the country's interior and returned to Georgetown too late to register. "This time, I was determined to vote," he says. "I think voting for me, this time around, is really important, because I endorse change. There were a lot of things that have been going on for the last 23 years, where the ruling party was concerned … that were not pleasing to me as a human being." Guyanese politics tend to divide along ethnic lines. For years after the nation's independence from Britain in 1966, the Afro-Guyanese People's National Congress ran the country. In 1992, the Indo-Guyanese People's Progressive Party wrested away control in what was deemed the country's first truly democratic election — one monitored by The Carter Center. The PPP had been in power ever since, but with the emergence of a new opposition coalition and more people looking beyond traditional ethnic boundaries, change seemed possible. At the request of election officials, The Carter Center returned to observe what promised to be a very close race. "I appreciate the observers here," Embrack says. "I'm also happy that they were able to interact with Guyanese; people of a different culture to them, a different lifestyle. And recognize across the board, that most people are saying to them, from their heart, how they feel." Embrack has had many jobs in his 40 years — working as a police officer, a clerk, a security guard, a mechanical operator in the mines, and now, a taxi driver — but he dreams of being a chef with his own restaurant. He is already making and selling marinades. He wants a better future for his nine children, and he thinks a change in government will help make that possible. In the end, he got his wish. Five days after the polls closed, the opposition party was declared the winner in what The Carter Center said was a credible election. What the future holds remains to be seen. But Embrack is hopeful. "I'm always an optimist," he says. "I would like to see Guyana be back to the days of old, when it was the breadbasket of the Caribbean."